This is very famous Indian Punjabi cuisine. 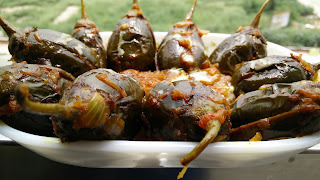 These small little brinjal are very cute and when tamarind and jaggery are added to it, the taste enhances manifold. Slit the brinjals diagonally giving 2 slits. Coat the inside of each pcs with a mixture of salt, red chili powder and turmeric powder. In a Kadai or non stick pan, add 1 tsp oil, sauté onions, add brinjals and mix well. Add little more turmeric and red chili powder, salt. Mix water and cook for 10 min. Once brinjals are cooked, add tamarind pulp and jiggery. Allow it to simmer for 5 more minutes. Serve with garnish with cream.